How do you spend your weekends? Shopping. It’s a typical routine for most Calgarians including me. In a rare occasion, fortunately, I managed (much apt word is struggled) not to buy anything. Nonetheless, my weekend trip was worthwhile because I’ve learned that Chinook Staples is one of the recycling depots in Calgary. I haven’t been there for quite some time, so when I saw the recycling fixtures standing at the far left corner of the customer service I’m delighted. 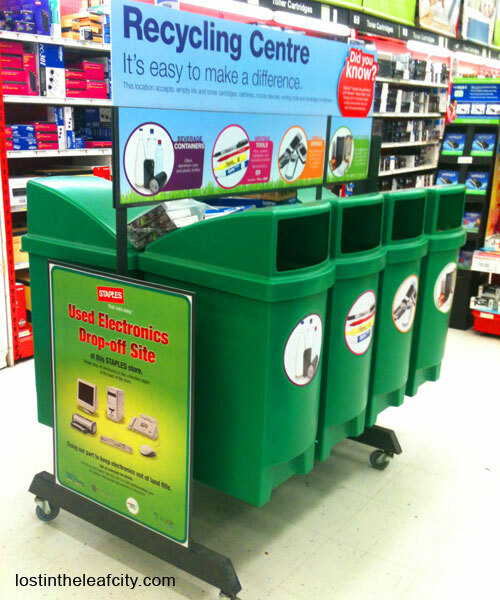 I, myself, have been looking for an accessible store offering an electronic recycling drop-off spot. Inside the fixtures I saw recyclable materials such as pens, batteries (must be contained inside a sealable bag), keyboards, mice, and ink cartridges. Note: The Recycling Centre is moved at the back by the office furniture display (table, chair etc.). The e-wastes are still stashed in my closet waiting for the appropriate time and place for disposal. By my next trip to Staples, I would try not to forget the empty ink cartridges and pens. May they be reused properly. Having an awareness of the recycling fixtures in Chinook Staples has urged me to search how the City of Calgary is managing the electronics recycling. It turns out that you can drop off electronic waste in different depots (for residents only) in Calgary. Have you found other spot? Share it to encourage everyone: spare a time of discarding gadgets and stuff the RIGHT way.